New revelations have been made about what occurred behind the scenes to help douse the tension built up by the Apostle Suleiman and DSS face-off. It has been revealed that the invitation of Apostle Johnson Suleman to the office of the Department of State Security, DSS, would have turned violent, if not for the intervention of a former Governor from the South South, Daily Post reports. 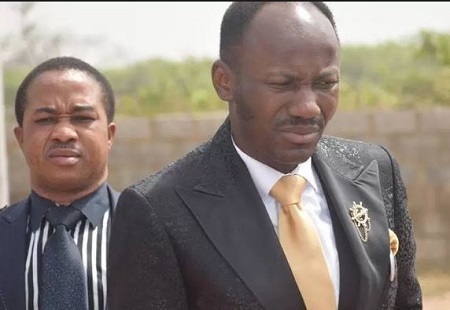 It will be recalled that that Apostle Johnson Suleman, General Overseer of Omega Fire Ministries Worldwide, met with top officials of the Department of State Services, DSS, Monday night. DSS had invited him for questioning over ‘inciting’ comments he made against Fulani herdsmen. Before the meeting, Suleman stated the DSS did the right thing by inviting him for interrogation. “I presume the right thing was done. They have been in touch with me to come and that is why I am in Abuja, so that I can see them”. He insisted that his comment was based on information from a reliable source that they were targeting him and his church. But the build-up to the meeting involved several pre-meetings to calm nerves nationwide and also ensure neither DSS nor Apostle Suleman got confrontational. Daily Post reports that the meeting was championed by a former South-south governor who served for eight years. This is contrary to the claim in some media reports that some leaders of the Christian Association of Nigeria, CAN, “brokered peace” between the Apostle and the DSS. According to Daily Post, an impeccable source revealed that although CAN did not deny Apostle Suleman, what the body did in the whole matter should not be over-emphasized. “I read that CAN mediated a peace deal. Which CAN? Is it the CAN that declared that it will not accompany Apostle to DSS office? I read it on your site; I still have the link. “Let me tell you what happened because it is always good to give credit to whom it belongs. An ex-governor was the one who was running up and down holding meetings to ensure that this matter doesn’t degenerate. Tension was high all over the country. Those who know this will confirm. “If you recall, Apostle and his entourage left Mabushi around 2pm but got to DSS office some minutes past 8pm. Within those 6 hours, do you know what happened? “Do you know how many calls were exchanged by prominent men and women across Nigeria for the sake of peace? I am taking about influential citizens I cannot disclose. “Yes, some CAN members called and visited Apostle in solidarity. But that was all they did to the best of my knowledge. The individual that coordinated the outreach was the former governor." Asked if other prominent Nigerians intervened, the source answered in the affirmative. “On that Monday, those who directly and indirectly mediated include serving and former governors; serving and former Ministers. Even a number of politicians, ex-ambassador’s, first class monarchs nationwide as well as Christian and Muslim leaders reached out. “One of the serving governor that showed solidarity is from the North. He initially wanted to run for presidency. Apostle told him he won’t even get ticket let alone contesting. He advised him to run for governor that he would win. “A former IG too spoke to those in authority. Apostle told him years ago that he would attain the top job. He laughed and said it wasn’t possible because he would soon retire. When he was appointed, one of those called was Apostle. “There is also another serving governor in the North whose election was argued till Supreme Court. He doesn’t even joke with Apostle. He was in Abuja that night. Apostle is spiritual father to about 7 governors and 9 former governors. “All these people and others showed support not because they support any conflict in Nigeria or particularly agree with what Apostle said, they just could not sit by and allow the situation get worse and Apostle honestly appreciates their efforts. “But like I said, the former governor was the one who really led intervention and tirelessly led peace talks. It is not CAN I insist”. The source also told Daily Post that the DSS has stopped monitoring Apostle Suleman’s phones. “His lines were bugged after the video went viral. They have now debugged. Part of the agreements was that Apostle Suleman should remain silent on the matter to douse tension. No more provocative comments. “Also, for now, he would not grant any interview concerning why he was invited. So if anybody comes out to quote him on this very issue, ‘na big lie!’.